Not sure what it is about tea, but I’ve always had a soft spot in my heart for it. Being raised Italian, expresso was the way to go in our family and we jumped in the deep end of the pool with my Nana, trying to down the tiny cups before our taste buds caught up. Always the black sheep of the family, I became a tea drinker. Which seemed practical, seeing as how complicated the expresso machine was. Tea. Perfect. Simple. Now, like in centuries past, we are again seeing natural, loose tea blends. No two cups are the same. I LOVE that there are so many varieties. I LOVE that loose tea has so much depth, and warmth and ﬂavor. Tiesta Tea offered me my choice of ﬁve teas. Here’s what I ended up with…. Earl Grey de la creme. Classic and true to form, the vanilla ﬂavoring and lovely blue mallow blossoms make this tea invigorating and energizing. Served hot after a cold morning jog, the cafeine keeps me moving throughout the day. Skipping breakfast? It happens, but its best to avoid eating your little ones table scraps. Flapjack Oolongs the way to go. Think of it as a meal in a cup. The syrup smell reminds me of pancakes, but as a slenderizing tea, it does the job and satisﬁes quite nicely. Peaches and cream. Smooth and delicious, with just the right amount of sweet. True to its name, the peach ﬂavoring is subtle, and creamy. With no caffeine, this is a perfect tea to wind down with after a nice meal. Nutty Almond Cream. This is the tea you bring out for company. 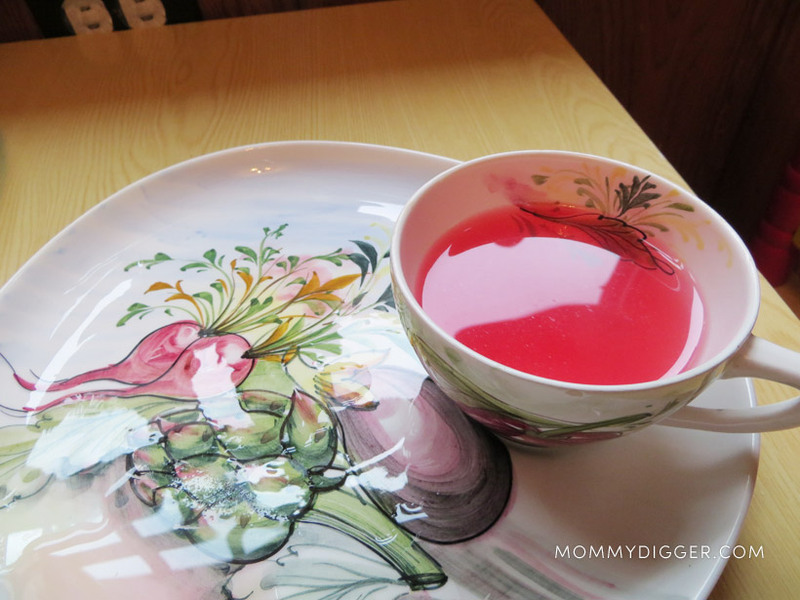 Once steeped, the color of the tea is a perfect shade of pink. The aroma is addictive, a sugary scent that reminds me of roasted almonds from a fair. Fruity pebbles. Green tea never had it this good. This is Tiesta Teas #1 seller, and with good reason. Fruity Pebbles has real pieces of dried Papaya, Pineapple and Strawberry, its the perfect blend of green and white tea, and because the caffeine is low, you can drink it day or night. They say that scent is the strongest sense tied to memory. I think my enjoyment of tea comes in two parts, the taste, and the aroma. Tea is a wonderful way to enjoy the simple things in life. The best part of Tiesta Tea is that the tea stands alone. No need to add sugar, cream or honey. So there you have it. Put your feet up, take a sip, and make some new memories. BUY IT: Tiesta Tea is available for purchase on the Tiesta Tea website and in stores nationwide, find a store near you. I love love love tea! I’ve never heard of Tiesta tea but now that I have I’m definitely going to give it a try, it sounds wonderful! The fruity pebbles tea sounds delightful! Thank you for the review. I absolutely love tea and I have never tried this. I love that you said you dont even need any cream or sugar! I definitely may try this! I’ve never heard of this brand before. It sounds and looks delicious! I love drinking tea, thats pretty much all I drink other than water. I have never heard of Tiesta Tea before , i’ll have to try it sometime. I’m a tea lover, hot or iced. I love the tea they serve at Chinese food restaurants but not sure what kind of tea that is. these teas sound wonderful and would love to try them all, especially the Earl Grey de la creme.